Even though most people think about GPS when they think about location-based technology, it has evolved beyond GPS and is now heading indoors. After all, people spend a lot of time in places like shopping malls, grocery stores, office buildings, museums, hospitals, airports and more. GPS isn’t enough to map these indoor locations. So it makes sense to develop the necessary technology. As a result, the market for inside location tools is growing fast. Companies are coming up with unique solutions to meet the diverse needs of the customers. The forecasts estimate the indoor location market to be around USD 40.99 billion by 2022. The rapid growth is a testament to the usefulness of the technology. You’ll notice that your car GPS system is slower at pinpointing your position than your smartphone. The reason is that your car GPS only relies on satellite signals. But in addition to GPS, your smartphone uses cellular tower signals and WiFi hotspots. Due to the shorter distances and more information, your smartphone can find your position faster. It's also more accurate. 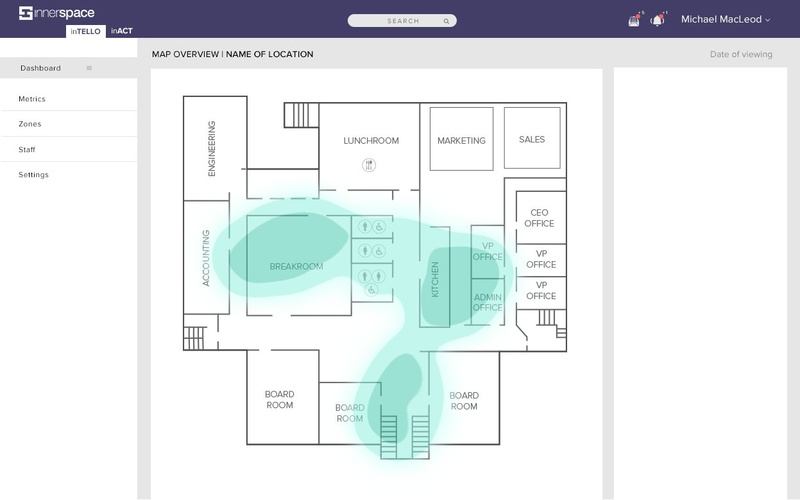 Indoor location technology takes the idea of using multiple signals further. It uses cellular towers, Bluetooth, WiFi signals, IoT sensors, LiDARs, cameras and other presence technologies to create more robust solutions. Let’s take a look at two key components we leverage within the InnerSpace platform. LiDAR - LiDAR (which stands for light detection and ranging) is already popular in self-driving cars. It’s the same technology that scanned the NASA Space Shuttle Discovery before it returned to earth. This laser captures high-resolution 3D data that can be used to create maps 3D models of objects. We use LiDAR to create accurate models and maps of indoor spaces - right down to tables and chairs which forms the foundation of our location platform. LiDAR is very effective and the maps and models are created almost instantly. Signal Triangulation - Signal triangulation helps locate people using information from GPS satellites, cellular towers, WiFi hotspots and Bluetooth devices. While we don’t use GPS as its signals are generally not available indoors, we use radio signals from WiFi, Bluetooth, and Ultrawideband technologies in our sensor. Signal triangulation algorithms, measure the signal strengths from these sources (usually a cell phone, smartwatch, or tag) to allow us to pinpoint the position of people within the space. Cameras - The InnerSpace platform intentionally avoids storing personally identifiable information, thus cameras are not a default component of the platform. However, for deployments where high count accuracy is required in smaller zones, we can incorporate cameras to augment the accuracy of traffic counts. Door Counters - These have been around for a while - it’s the same technology that when you enter a store will chime to let the owner know you’ve arrived. For clients that need to know the moment someone enters/leaves a space, this added technology can be incorporated with traffic patterns to maximize the resolution of flow. RFID - Radio Frequency Identification is used for detecting and identifying the presence of an object, typically used in loss prevention, tracking equipment, and manufacturer assembly lines. Most indoor location companies work as service providers. Using the various components described above, they try to build custom solutions for each facility or location. The problem with this approach is that these solutions are expensive and time-consuming to set up and operate. At InnerSpace, the benefit of our platform is it’s plug-and-play for any location. It provides faster results. You can have the system operational in a few days. Indoor location dashboard highlighting corporate office utilization. Businesses are interested in indoor locations systems because they provide opportunities unimaginable with outdoor GPS. While the industry to-date has been focused on improving retail experiences, we believe it can have far greater impact for businesses, their employees and people in general. Accessibility - With turn-by-turn wayfinding enabled by indoor location, businesses can offer never-before-available solutions for people with accessibility needs. Companies like Microsoft are making accessibility a big priority to empower their employees and visitors on their campuses through technology. Optimizing Real Estate - Real estate costs continue to rise, and it’s one of the biggest costs a business incurs. Yet property managers and tenants alike, struggle to understand the value-per-square-foot, how much is needed, how best to optimize their space, and how to use it to create new services and experiences. Indoor location provides the data to answer all of these questions. Couple indoor location with building management systems and you now have a powerful tool that proactively and autonomously adjusts lighting, heating/cooling, and security based on occupancy and traffic patterns. Improving Operations - When you know how employees work and how customers behave in your space, you have massive amounts of data about your two biggest resources - people and real estate. Knowing how to staff according to consumer behavior, when and where to clean based on utilization, or how to improve productivity by co-locating teams, businesses can achieve a 10:1 return when using our platform to streamline operating expenses and redeploy resources for growth. e911/Emergency Services - Calling 911 from your home phone (landline) ensured that emergency responders could identify your location. With the ubiquity of cell phones from indoors, exact positioning is difficult to obtain. Indoor location technology can solve this problem. Read more about it here. Compliance - The ability to record and validate critical procedures for legal and insurance reasons, as well as for client reporting, can be time consuming and near-impossible if done retroactively. Indoor location can fill in some of the needed gaps in the data by tracking, for example, the presence of equipment throughout the day. Was a sign positioned warning people about a slippery floor? Were employees evacuated from an area in a timeline manner after a chemical spill? Indoor location can automatically provide the data needed to validate processes and claims making it a win-win for both businesses and insurance companies. Loss Prevention - While most people think about the application of indoor location to consumer retail experiences, there are opportunities to go beyond selling and marketing. Loss prevention for high-end items can be achieved through pattern recognition by tracking abnormal movements. This information can be used to alert managers/security to increase presence on the floor, support police investigations, and identify thieves should they enter another store in the future. Employee Experiences - The future of work continues to evolve. Tailoring the experience to the needs of the company and its employees requires the right data to do so. The continuing trend of hot-desking, hotelling and line-of-sight room bookings can be improved by using occupancy and utilization data to book meeting rooms based on availability not calendars, or understand ideal days to travel to the main office when commuting far distances. Knowing where key equipment is located and automatically connect to printers based on your location - all can be enabled by indoor location. You can consider indoor location technology the improved version of GPS. It has opened up new opportunities in various industries like retail, manufacturing, hospitality, and healthcare. It can provide a competitive advantage for your business. With the right indoor location technology, you can easily scale your operation to serve more customers without expanding your workforce.